Life in the desert is challenging. There is very little water and it can be extremely hot during the day. 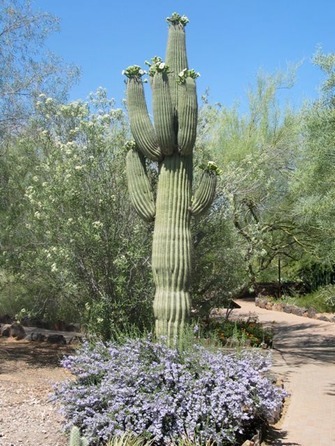 To survive, saguaro cacti use water more efficiently than plants growing in other climates, and they have ways to keep themselves cool. What do you see when you look at a saguaro? Do you see spines? As you might expect, spines have long been thought to protect cacti from animals that might eat them. Scientists began to wonder about the purpose of spines, however, when they realized some animals aren’t deterred by spines and some cacti have soft spines that aren’t much protection. Can you think of any other reason cacti might have spines? Form the clay into a golf ball to tennis ball-sized lump. Place it on a hard surface that won’t be harmed by contact with clay (that is, not on the carpet, folks :-)). Place the ruler against the clay. Hold the flashlight about two inches away from the clay for five minutes. You might want to set it up on a book so you don’t have to hold it. Take the temperature at the surface of the clay in front of the flashlight every minute. Then shut off the flashlight. Allow the clay to cool a bit and then stick toothpicks into the clay all over the side toward the flashlight, until it resembles a cactus. Now turn on the flashlight for another five minutes. Does the clay look any different? Take the temperature of the clay as close to the surface as you can, under the toothpick spines. Record the temperature once a minute for five minutes again. Did the spines cause any changes? Scientists have found that some spines shade the surface of the cactus and/or act as radiators to keep the surface of the cactus cooler. Many cacti have a waxy layer on the outside. What is it for? Place a napkin or sheet of paper towel folded into fourths on each plate. Pour four Tablespoons of water on each napkin (give or take a Tablespoon, depending on the absorbency of the napkin). The napkins should be equally wet or damp. Tear off a sheet of waxed paper. Fold it in half and then wrap one of the napkins inside it, taking care to fold over the corners so no air can get in. Leave the wrapped napkin on one plate and the unwrapped napkin on the other. Come back the next day and feel how wet each napkin is. If you live in a moist climate, you might want to leave it two or three days. What do you expect will happen? Giant Cactus Forest Diorama (scroll down) from the American Museum of Natural History.